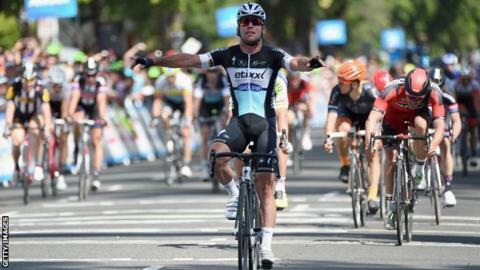 Britain's Mark Cavendish sprinted to a dominant victory in the first stage of the Tour of California. The 29-year-old Manxman, riding for Etixx - Quick-Step, comfortably beat Tinkoff-Saxo's Peter Sagan into second, with Jean-Pierre Drucker (BMC) third. "It was chaotic," said Cavendish, who was led out by team-mate Mark Renshaw. "When Mark is stressing you know it's stressful. But I don't have to think too much even with the chaos, so I can focus on saving energy for the sprint." William Clarke (Drapac) is second in the overall standings after collecting time bonuses on the 203km stage, which started and ended in Sacramento. Monday's second stage of the eight-day race heads 193km from Nevada City to Lodi.